Last night we decided to try to take full advantage of the holiday happenings and take a tour of the lights around us-even though there is no snow. I looked up where lights are on grkids.com, printed a list out, and was ready to go! I envisioned the children snugly in their jammies with their faces pressed against the window peering out in the dark at all of the decorations in awe. We had given the kids a bag of kettle corn, a rare treat, and had each of them pick an object associated with the season to count in the decorations we would see. Reindeer, Santa Claus, and snowmen were chosen. I thought this would be a fun game and keep their eyes on the decorations. Everyone loaded into the car, the oldest a bit grudgingly. We couldn't get the side sliding door to shut in the mini van. This is a problem that's been going on for a super long time and each time I bring it in to get repaired the technicians swear that it didn't malfunction on their watch, even though it has malfunctioned in their garage as I unload the kids. But I digress. The door is forced shut by the blunt force of my husband. Mission accomplished. We are now on our way. My vision of those cute noses against the windows while hearing sighs of contentment by my offspring will not be deterred by a stupid minivan! Two minutes into our drive we hear a voice ask how long this would take because his stomach hurts from the popcorn. Five minutes from the house we are at the first destination. 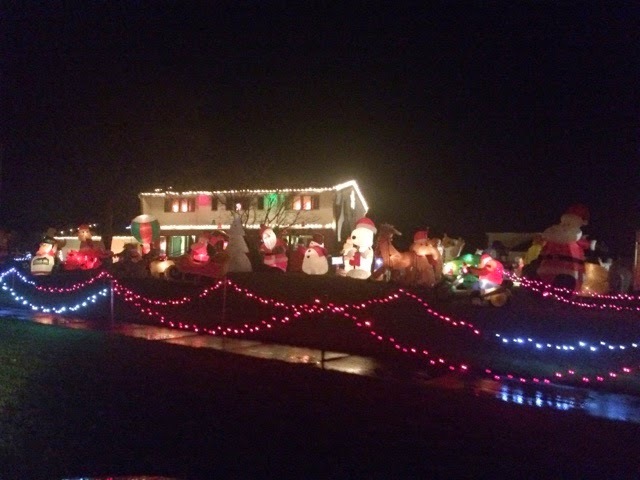 Lights everywhere and blow ups fill the yard. The kids were impressed, but there weren't enough snowmen. Santa was at a huge advantage in his appearances on the lawn and the fun game was turning into an all out brawl. Our next stop was a little longer to get to, but it was an actual light show with music! The kids would definitely appreciate that! On the way there are no snowmen! Yelling about people not displaying snowmen follow. Mom issues a gag order. The kids make up a new game naming songs. The youngest sings the songs instead because he doesn't know what they are called (listening to the words he is singing we realize he doesn't know those either! Peach pourage hot peach pourage cold...). Fighting follows as to what is allowed. The chuckle and glow I had from hearing the wrong words sung quickly dies and a threat of another gag order is issued if they can't stop yelling. And of course I yell this. Let's not kid ourselves here, you would yell too! The kids are ruining my vision of their cute innocent faces enjoying the wonder of flashing electricity! We reach the house with the musical light show. Look at all the lights flashing and dancing! Look at the snowman! Look at the penguin choir! Wow! It would have been nice if the kids were exclaiming all of those observations, but no. It was me. Kids try to issue a gag order on Mom so they can concentrate on their game. Time for the music! We forgot the music! That will make the night feel more festive and joyous without a doubt! Nope. The radio does not work due to something with the door and it has reset and needs a code. Mom actually growls under her breath at this point. Ok. Let's pull it up on our phones. Do you know how many 105.1 radio stations there are out there that you can access via the Internet? Just keep downloading apps to see if one of them are it. In the mean time, the kids could care less about the lights or the music, they continue to chew in my ear, and bicker about songs. This is the most wonderful time of the year. Sigh. Let's just head home and put the kids to bed.